Have you noticed a recent trend in my posts? Tanks and Peanut's favorite hobby lately is PAINTING! This works great for me, because I love paint and enjoy making homemade paint recipes. JZ and J-Bug have always been big fans of painting, and I love activities that all four boys can enjoy together. 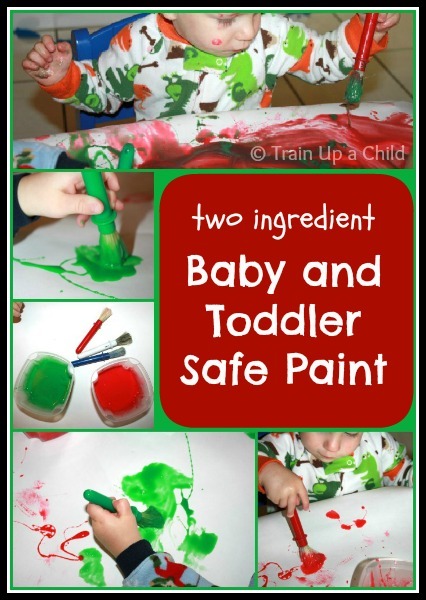 The wonderful thing about this homemade paint recipe is that is only calls for two ingredients, and it is edible making it safe for babies and toddlers. Making edible paint is so easy with these two ingredients. Just add a few drops of food coloring to the condensed milk and stir! I mixed yellow and red to make orange and red and blue to make purple. Once you have the decided shades, the paint is ready to go! The good news is that even though it is edible it doesn't taste great. This deters most children from eating a large amount. However, if they do eat a lot it won't hurt them! Tank tasted the green and made a face. He took a second taste before decided that he for sure did not like it. This paint is great for all ages. JZ (5) and J-Bug (3) have every bit as much fun with sweetened condensed milk as their baby brothers. As you can see, this is a messy activity. It is also very sticky. It cleans up easily and does not stain, but don't say I didn't warn you about the mess! Don't let the mess scare you, though. 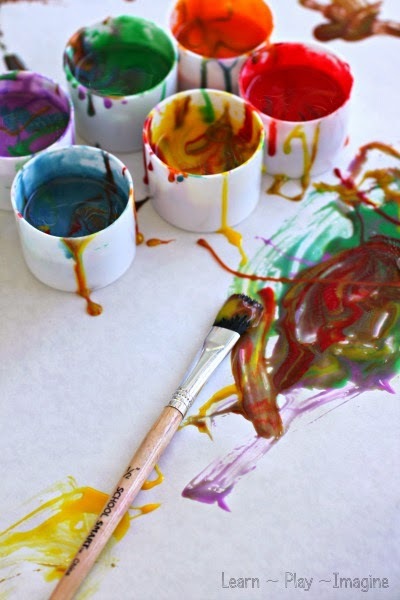 Here are tips for messy play as well as laundry tips to avoid stains and keep clothes bright. Peanut got a wipe to mop up the paints after he poured them onto the paper. The paint dries bright and glossy and doesn't flake off of paper. This would also be a fun recipe to use on edible materials, like making rainbow toast. Cute idea!! Stopping by from the Schoolhouse Crew. Glad to have you aboard! I love this idea!!!!!!! Thank you so much I will most certainly be trying this!!!!!!! So much fun! I think I'd want to join in and start eating it as much as painting :) Thanks for sharing! Cute toddlers and wonderful ideas which you give. Thanks for sharing. My little baby girl like different things to do and I think this will be enjoyable for me also when I'll see she is doing this. Love this! My only question is how does the paint hold up? Can you keep the pictures? This is wonderful, I'm going to use it in the nursery for VBS. Thanks so much! Going to try this out! Looks like fun. How much food colouring do you need to add? Egg yolks and food coloring for painting on sugar or butter cookies or bread for toast is fun too!! Add a little water to get just the right consistency. We typically only make as much as we use right then. I think it could be stored in the fridge in an air tight container for a few days. Do you know if it comes out of clothes? Thanks for sharing this! My baby sis is 3 and just loves paint but I always worry about her eating it! This sounds like fun! Will the milk spoil on the artwork and stink after a while? Can I use the paint on a fabric canvas? I have never tried it. I would test a small area first. Is this safe for a 6 month old? It depends on how likely your little one is to eat very much. A tiny taste wouldn't hurt, but since it's a milk product I wouldn't let a baby that one sample too much. Goofy question...but once the paint dries can the "artwork" be saved? Or does it have to be thrown away since it's made of condensed milk? Thanks! We have never had a painting "go bad" using this paint, but we've never saved one more than a couple of weeks. would this work on pumpkins?